We've all been there. Your last Disney trip is several months behind you. Photos from A Dream Come True Parade in Frontier Land October 2011 in WDW. Seriously, what do you do when you're aching for a little bit of that Disney magic but have no immediate plans to visit Walt Disney World? Fortunately, we live in an age of technology, where our favorite rides and attractions are just a click away. Here are a few of my favorite ways to sneak in a bit of Walt Disney World during my times between trips. Podcasts are a terrific way to stay current on the latest news and happenings around the World. Of course, Jennifer Marx and Sara Varney put out the weekly Passporter Moms podcast, chock full of tips, interviews, and passion for all things Disney. It's one of my faves, and I've run countless miles listening to these two awesome Moms! But Walt Disney World is near and dear to many, and as such, there are lots of podcast options to choose from. Just do a search for "Walt Disney World" in iTunes, and you'll find dozens of shows. In my opinion, some of the best include Lou Mongello's WDW Radio Show, and WDW Today with Mike Scopa, Mike Newell, Len Testa, and Matt Hochberg. Podcasts are my go-to listening when I'm running or driving to work and have lots of time to kill, and it's a great way to stay current and get ideas for my next trip. Sometimes, I want a more subtle reminder of my days at Disney, and the perfect fix comes in the form of music. Walt Disney World is home to hundreds, if not thousands of pieces of music, and many of them have been the soundtracks of our happiest days. If you love to hear the full ride soundtracks for your favorite attractions, ambient music from different theme parks and pavilions, or even the narration for the monorail, you must check out www.mouseworldradio.com. It's a free, streaming audio site that plays music from in and around the parks, 24/7/365. The music even changes seasonally to include holiday carols and shows featured at Walt Disney World for the holidays! While you don't have a say in what you're hearing, you will get a great sample of soundtracks from all around the World. They even have an iPhone app, so I can listen on the go and get that fix whenever I need it! However, sometimes I am in the mood for a specific sound. Maybe it's that rugged piece of the Wild West from inside the lobby at the Wilderness Lodge. Or the fountain area music from Innoventions (my favorite piece of Disney music ever!). For this, You Tube is my friend! You can type in the name of the specific attraction, and by adding the word "soundtrack" at the end of the search phrase, it will likely give you what you're looking, or should I say, "listening" for. There are even soundtracks from extinct attractions and shows here, like the original Epcot entrance music! Speaking of You Tube, sometimes we make this a family affair. Last year, we took our 3- and 1-year-old kids for their first Disney trip, and made lots of wonderful memories. The kids both especially loved It's A Small World, and one dreary winter night, we decided to You Tube the ride, with the laptop hooked up to our TV. We were pleasantly surprised to find many bright, clear, beautiful videos of the attraction. It soon morphed into a friday family tradition. We eat pizza in the family room and watch You Tube videos of our favorite rides, with the kids calling the shots. Some of the dark rides do not have the best quality, but our kids, now 4.5 and 2, still LOVE watching them and it always sparks a conversation about what we'll do on our next trip. Sometimes these conversations even turn into an imaginative game to reenact some vacation highlights. We particularly love "Chef Mickey's," where Dad dresses up as a chef and Mom helps Mickey and his buddies bring the food to the "customers," or "Tower of Terror," where we all pile onto the couch and pretend that we are going up and down and up and down. (Yes, my 3-year-old rode it last spring!) My kids love it--we all do--and it's some of my favorite family time! Your You Tube video searches don't have to just be attractions. There are beautiful video montages of the different resorts, complete with themed music. They'll take you right back to your favorite trip, or help you daydream about the next one! Here's a tip: because some of the rides are found in several parks worldwide, I always add "Disney World" to the end of my search phrase to make sure I'm coming up with the ride that my kids remember from our trip. And as always when watching internet videos with kids, you should preview it first to make sure there is no inappropriate content. I also love to keep up with the latest happenings by following the official Disney Parks Blog. I can get quick, daily updates about what's going on, not just at Walt Disney World, but also the other Disney parks around the globe. I excitedly followed the construction of the new Disney Fantasy cruise ship, and I can't wait to see the unveiling of Cars Land at Disney California Adventure park this summer! 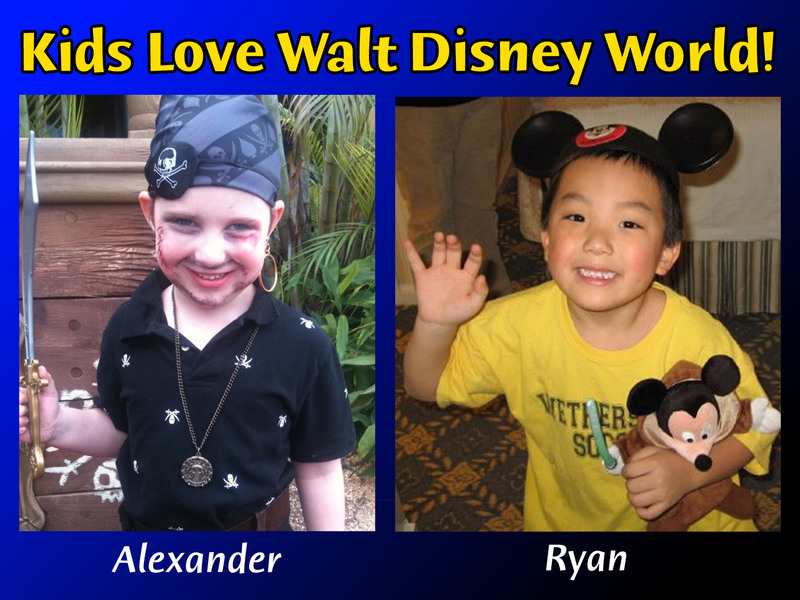 Kids Love Walt Disney World! No matter how or where I get my Disney "fix," it definitely makes those months between trips more manageable. And the tips I hear and read during those times between travels always make the next trip even more memorable! About the Author: Alison is a PassPorter Message Board Guide and a Travel Planner affiliated with with MEI & Mouse Fan Travel.